I used to create calendar events for tasks I needed to do over and over again. Now there is an easier way, and it works in both Google Keep and Inbox by Gmail. Both applications have reminder functions that work almost identically. The difference between the two is where you can find these reminders in the future. You can see my previous post about these differences here. in either application. You will then be prompted to enter the task or reminder you would like. Next, to get to the repeating setup, you need to select the Pick a Date and Time from the scheduling screen. Choose the date, the time, and then choose what type of repeating schedule you want (Daily, Weekly, Monthly, Yearly, Custom). I usually choose custom where I am able to set any number of options including setting up an end to the repeating task. Remeber, this feature is available in both Keep and Inbox and executed in a very similar manner. 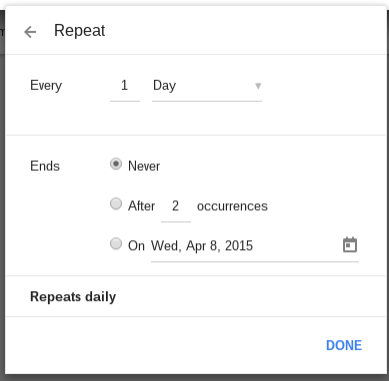 This is a great feature that for me has replaced entering repeating tasks in Google Calendar. How have you been you bee using repeating Reminders? I say "ok Google, remind me to put out the trash every Wednesday at 9 p.m."
The Google now reminders page then contains a section called ongoing. Thanks I did not try that. I will update the article later this week. Thanks for the reply. It helps setup almost all my reminders. Is there any way to specify a date for the 3d Sat in month or 4th Thu in Nov? As months vary with number of days/weeks the actual date can change year to year. Still can't figure out how to get reminder that works with 4th Thursday of Nov; Thanksgiving. For example Thanksgiving is 4th Thu which will occur starting in 2015 on Nov 26th and then changes to the 24th. Following yrs 4th Thu falls on Nov 23d, 22d, 28th, 26th, 25th. If I can set a reminder for Thanksgiving I can handle all the other repeating reminder combinations. Yeah I don't think that granularity is available. However with the announcement today of Google purchasing Timeful Inc, I think that type of stuff will be coming in the future. Your instructions do not fit with what I see. I am using GMail Inbox, which requires only a date (not a time) for completion. How do I get to the "scheduling screen"? I do not see what you describe; I am using GMail Inbox under Win7 and FireFox. What I see has only a date, not a time. How do I get to the "scheduling screen"? I see no clock. I have sent a screen capture of what I see in separate email. Thank you- the reminder appears in Calendar Great!